More than a decade after the Scorpions were killed off by the ANC of Jacob Zuma, President Cyril Ramaphosa announced the establishment of a similar directorate in the National Prosecuting Authority (NPA) that will report to advocate Shamila Batohi, the new national director of public prosecutions (NDPP). Ramaphosa delivered his second State of the Nation Address on Thursday evening during a joint session of Parliament during which he made a number of major announcements and putting economic recovery at the top of his government’s list of priorities, including the expected unbundling of Eskom and the reconfiguration of national intelligence services. 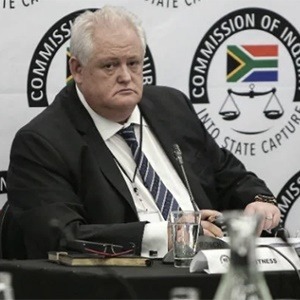 The announcement of a new Scorpions-like unit however signals a major intervention in the fight against grand corruption and state capture and seems to acknowledge the deep malaise that exists in the law enforcement and prosecutions environment. Ramaphosa also managed to completely disarm the EFF and its leader, Julius Malema, who threatened to disrupt proceedings because of the links between Ramaphosa’s son Andile and corruption-tainted company Bosasa. A confident Ramaphosa, standing at the podium with his left hand buried deep inside his trouser pockets, joked with Malema that if the EFF wins the election he would sing the song “Thuma Mina” from the podium. He added that DA leader Mmusi Maimane will also join the band he intends to form. Batohi, who started her new job less than a week ago, sat in the presidential bay and smiled when Ramaphosa wished her luck in her new job – and continued smiling when he announced the formation of a new investigations and prosecutions directorate strikingly similar to the now-defunct Scorpions. The president told MPs the new directorate will report to Batohi and will bring together investigations and prosecutorial resources from within and outside government. “In broad terms, the directorate will focus on the evidence that has emerged from the Zondo commission of inquiry into state capture, other commissions and disciplinary inquiries,” Ramaphosa said. The country’s most important parastatal will be unbundled into three separate business units under the umbrella of a single holding company. Eskom will, as expected, be broken up into separate generation, transmission and distribution units. The president pre-empted the expected criticism saying that consequences will be dire if no action is taken: “Eskom is in crisis and the risks it poses to South Africa are great. It could severely damage our economic and social development ambitions. We need to take bold decisions and decisive action. The consequences may be painful, but they will be even more devastating if we delay,” he said. One of the most unexpected – but not surprising – announcement was the decision to reconfigure the country’s intelligence services in domestic and international arms. 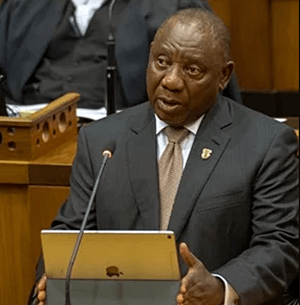 Ramaphosa told the National Assembly that national intelligence services must be focused on securing the country’s safety locally and abroad and must not be in service of any party-political formation. The restructure of intelligence is based on the recommendations of Sydney Mufamadi’s review panel, the president said. Ramaphosa caused a stir when he told Davos that the last nine years – those under the leadership of former president Jacob Zuma – were “wasted”. Although he didn’t express himself that strongly in the speech, he repeatedly intimated that the country has been seriously damaged by corruption, the debasing of democratic institutions and the erosion of trust in government and the country. Ramaphosa started his speech and concluded it by emphasising the challenges the country faces. He told MPs the country is emerging from “a period of uncertainty and a loss of confidence and trust” and left them with Teddy Roosevelt’s “man in the arena” quote. If Zuma had delivered this speech, as he was bound to do a little more than a year ago, none of these five pointers would have been included. It would have been a crude election speech, praising his own government. This speech had substance – but as always, commitment and implementation are key. And this government does not have a good track record.